Univision is bringing Spanish-language programming to Canada, thanks to a licensing agreement that rebrands Corus Entertainment’s Telelatino Network en Español as Univision Canada. The new network will be carried by most of Canada’s cable and satellite platforms, under TLNE’s existing carriage agreements. 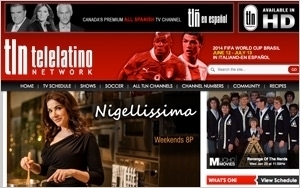 Launched in 2007, TLNE already carried a substantial amount of Univision content, including the Latin Grammy Awards, coverage of the FIFA World Cup and other soccer tournaments. Regular programs include Sábado Gigante, Primer Impacto, Aqui y Ahora, El Gordo y La Flaca, Premio Lo Nuestro, Feliz Año, and the Noticiero Univision network newscasts. Corus Entertainment’s other Canadian cable nets include HBO Canada, ABC Spark, Nickelodeon Canada and OWN: Oprah Winfrey Network Canada. While marketers are paying keen attention to the U.S. Hispanic population, the Canadian Hispanic population is also growing fast. According to Canadian government statistics, the number of Hispanics living in Canada increased from 217,000 in 2001 to 381,000 in 2011, the most recent year for which data is available. In proportional terms, Hispanics increased from 0.7% to 1.1% of the Canadian population over this period. They also tend to be fairly well educated: Roughly half of the Hispanics living in Canada have a bachelor’s degree. For Univision, this is just the latest in a series of new product launches, brand extensions and partnerships. In October, Univision teamed with ABC to launch a new cable and satellite TV network -- Fusion -- targeting millennial Hispanics with English-language content. Univision also invested in El Rey, a new English-language cable TV network created by Comcast and director Robert Rodriguez. In November, Univision joined forces with HSN to launch “Boutique Univision, una tienda de HSN” (Boutique Univision, an HSN store), a home-shopping platform targeting Hispanic consumers with curated collections of products, including beauty, home, fashion, culinary, electronics and holiday. And in December, it struck a deal with MiTú to create short-form Spanish-language content for syndication on Univision’s digital platforms.